In this exciting new video/audio/book combo, Mark Michell, bassist for the progressive-rock band Scale the Summit, breaks down the techniques that make him one of the most skilled bassists on the prog-rock scene. Topics include: utilizing the full fretboard; analyzing chords; voicing chords on bass; mixing fretted notes and harmonics; mixing chords and tapping; exploring bass line options; and more! By demonstrating his unique approach to the bass, Mark will help you to unlock your own creative potential! 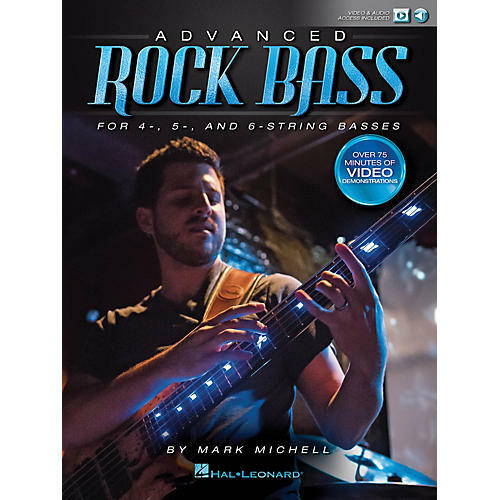 In addition to comprehensive video demonstrations and accompanying notation and tab for each musical example, Advanced Rock Bass includes ten backing tracks, each featuring a unique key center and chord progression, so you can immediately begin to incorporate Mark's techniques into your own playing! The price of this book includes access to video and audio tracks online, for download or streaming, using the unique code inside the book. The audio tracks include PLAYBACK+, a multi-functional audio player that allows you to slow down audio without changing pitch, set loop points, change keys, pan left or right - available exclusively from Hal Leonard!